Ferrets are fun, energetic, intelligent pets. However, they are also prone to many diseases and therefore require regular veterinary visits. Some of the most common diseases ferrets are susceptible to include: lymphoma, insulinoma, hyperestrogenism, distemper, and diabetes. Many of these are treatable and/or preventable as long as your ferret is seen regularly and diagnosed early by a veterinarian. Over the past few decades, ferrets have been extremely overbred in the pet trade to increase certain traits like desirable color patterns, non-aggressive behavior, and intelligence. As a result of this aggressive selective breeding, the frequency of many genetic diseases has gone way up. Domestic ferrets are much more likely to have endocrine disorders and cancer than their wild counterparts. Pay close attention to your ferrets eating and bathroom habits. Diarrhea, excessive drinking and urination, and anorexia are often early warning signs of serious systemic diseases. Hair loss and weight loss can be signs of adrenal gland disease which can be fatal if left untreated. 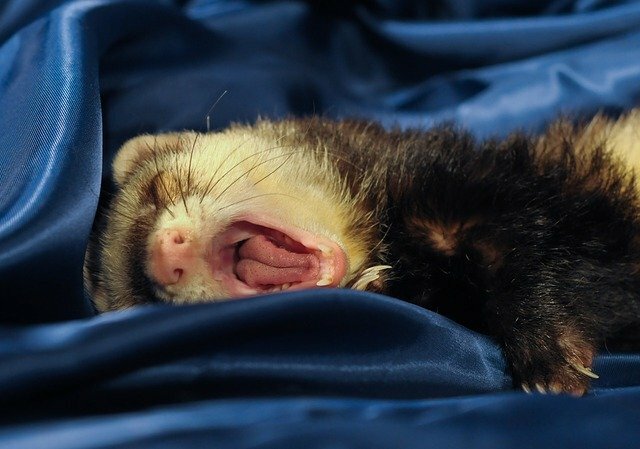 If your ferret is extremely lethargic and has a difficult time getting the energy to move it is often a sign of an insulinoma—a severe drop in blood glucose that can lead to seizures, comas, or even death. If your ferret is acting unusual at all it could be a sign of something much deeper. This is why it is so important to visit your veterinarian at least once a year for check-up and evaluation of your ferret’s overall health. Ideally, a ferret owner should be prepared to have check-ups performed every 6 months. Here at CEDARCREST Animal Clinic, we have the training and the tools to diagnose and treat almost anything that could make your ferret sick. We also carry vaccines for rabies and distemper that are recommended for your ferret family members. Please help us keep your pets healthy and safe by bringing them in routinely for their annual or biannual veterinary evaluations.